Before anything else, I would like to extend my gratitude for your interest in spending time in our beloved city. I'm fully aware of the undeniable fact that a huge chunk of the reason why Baguio City continues to grow and develop is because of the economic benefits that tourists have poured into the city through the years. Baguio City has reached its status as a top tourist destination in the Philippines partly through word-of-mouth. And at the forefront of this word-of-mouth campaign are the hundreds of thousands of tourists who flock to the city every year. So thanks again, tourists. You are a major part of the lifeblood of this city. You are directly embedded into the complicated system that has been keeping the city afloat since its founding over a hundred years ago. But here's the thing. Being a tourist destination is a double-edged sword. It has its dark side. Tourists can harm a place just as much as they can help it grow and improve. Thus this humble letter to tourists planning to visit or are currently in Baguio City. When I logged into Facebook this morning, I saw a lot of people complaining about the state of Baguio City this holiday season. People are crawling like thick ants in the streets that there is barely space to breathe. Vehicular traffic is so slow you'd be lucky if you are able to move 10 meters within an hour. Garbage is in every nook and corner of the city. Visitors are not respecting city rules and regulations. I thought to myself, it couldn't be this bad? So I went to town to sort of verify the teeth-gnashing I've read on Facebook. I reside in the nearby town of La Trinidad so I had to commute to town. It took me nearly two hours to reach Baguio City. This commute on average would take me 30 minutes. This shows how bad the traffic has become because of the congestion within the city. And yes, when I reached the city, trash is indeed everywhere and city rules and regulations are being violated left and right. Photo courtesy of Vickie Jaurigue via the Save Baguio Facebook page. Now, it would be completely unfair to blame all of these problems to tourists. City residents also have a part in it. However, it would be fair to say that the biggest contributors to these problems (at least this holiday season) are the tourists. I'm going to make this brief and clear. As a concerned individual, I've listed below some of the things that I would love tourists to do and not to do. Take these as friendly suggestions. 1) Don't treat Baguio City as if it's a huge waste basket. 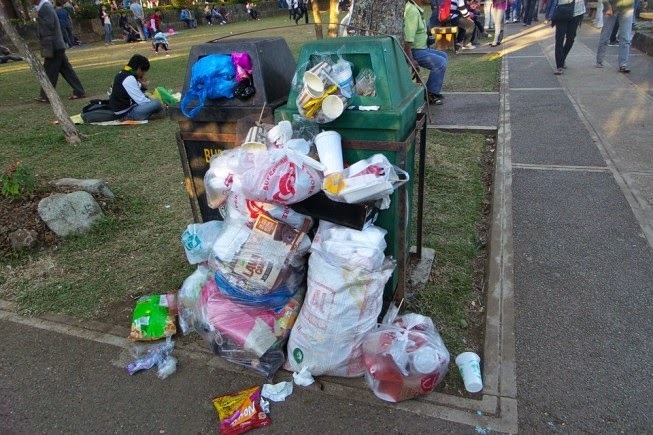 It's utterly disappointing to walk around Burnham Park and see trash and litter everywhere - under the flower beds, under the park benches, on the picnic grounds, etc. When I walked up to SM, I passed a lot of trash on the flower beds between the police station and Banco De Oro below the shopping mall. Candy wrappers and empty soda cups were deliberately thrown into the flower beds. It's highly recommended that you carry bags with you where you can place your trash. There are garbage bins distributed around the city but these aren't enough to accommodate all the litter produced by the thousands of residents and tourists. If you see a full garbage bin, don't just throw your trash around or near it because such act will cause others to do the same. Before you know it, the bin will turn into a mounting garbage dump. 2) Follow traffic and pedestrian rules. Most Baguio residents know how and when to cross the street especially within the central business district (CBD). They know what red, orange and green lights mean. With the influx of tourists, Session Road has turned into a mad house. The traffic lights seem to be non-existent. People walk and cross the street whenever they wish. 3) Don't bring your cars into Baguio City. As much as possible, try to take the bus. Baguio City has very narrow streets and nearly zero parking facilities. The city is having a very difficult time dealing with the number of resident cars already. Bring tourist cars into the picture and the city will literally choke. 4) Make sure that you have a place to stay before you travel to the city. At this time of the year, most hotels, inns and lodges are fully-booked. So if you come here without an advanced booking, you will likely find yourself stranded with no place to stay. Tourists often take this for granted but this is a very serious problem. Worse, there are scammers out there who prey on stranded tourists. Consider yourself warned. 5) Do a bit of research and read about the city and its people before you come here. You have no idea how insulting and saddening it can be to hear tourists say, "Asan na mga Igorot? Gusto ko makakita ng Igorot!". There's nothing wrong with the question per se but in the context of the rampant ignorance about indigenous peoples in the Cordillera, it's rather insulting. The truth is you are walking among them in Session Road, eating among them at a nearby fast food restaurant, etc. Or better yet, go to City Hall. The Congressman, Mayor, Vice Mayor, and majority of the councilors are Igorots. These aren't too much to ask. Do keep them in mind. So, welcome to the Summer Capital of the Philippines, enjoy your stay, have a blast, and always remember to put your trash in their rightful place. Thank you.